Marked or remarked with intent to deceive - These are usually inexpensive, common tubes remarked to make them more valuable. This is usually done by changing the type printed on the tube, but can also be done by changing the country of origin. There were several major perpetrators. Please do not use any of these malicious fakes to get ideas of potential tube substitutes. Marked or remarked as suitable substitutes - The original type is usually evident, but the tube is somehow remarked as suitable for another type. Again, do not confuse these with legitimate substitutes. "Friday at the Tube Factory" - These are factory printing errors. These are not malicious, but can be confusing. These pictures show a real oddity. The tube at left is on an octal base and is branded "United Electronics 6B4G". 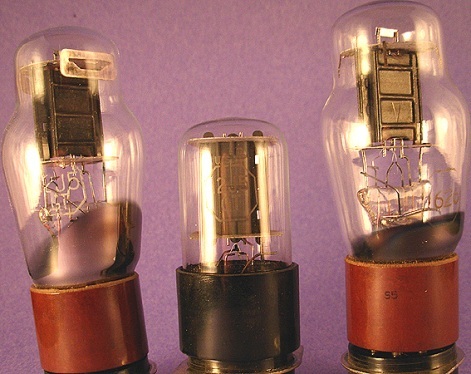 The tube at the right is a Western Electric VT-25 (transmitter-rated type 10). United was an old US maker of transmitting and industrial types. They NEVER made receiving tubes. Someone else owns the brand name and has used it to rebrand many types. 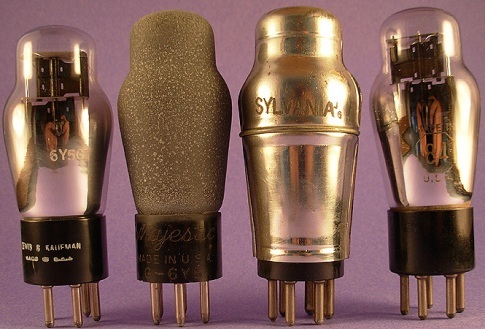 The tube at left is simply a rebased VT-25 made either by Western Electric or National Union. 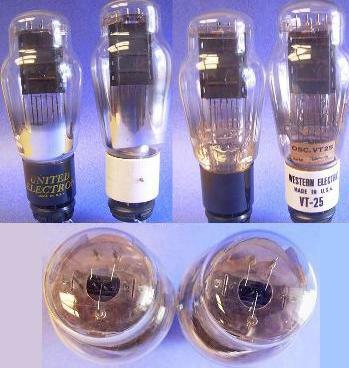 While VT-25s by Western Electric are pretty valuable now, they were cheap surplus following WWII. 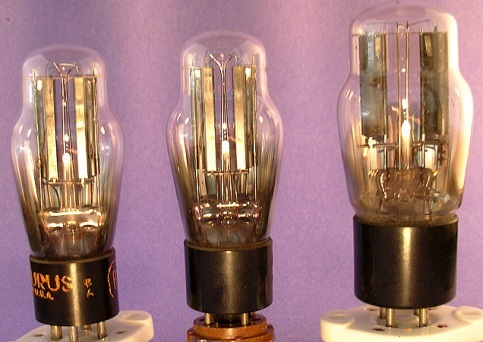 The feature that most gives away the fake as a Western Electric tube is the use of rounded triangular mica supports. I also want to say something about "mythical" single-plate 6A3 and 6B4G tubes (the 6B4G is a 6A3 on an octal base). In short, there is no such thing as a real single plate version of either. Most commonly seen single plate 6A3 tubes are actually renumbered VT-52 (not VT-25, as above) tubes. Again, VT-52s were extremely cheap on the surplus market, and they had absolutely no civilian use. Remarking them as 6A3s made them saleable. The biggest problem with using either a VT-25 or a VT-52 to replace a 6A3 or 6B4G is that the VT-25 has a 7.5V filament and the VT-52 has a 7V filament, while the 6A3/6B4G has a 6.3V filament. This means that new VT-25 and VT-52 tubes would probably function, but would have a markedly shorter working life at the lower voltage. The picture at left shows a 6CB6A rebranded as "6JK6" by International Components Corporation to the left of a real 6JK6. The third tube is a correctly marked 6CB6A. The second picture shows the same tubes rotated to show the internal structure. Note that the real 6JK6 has a sold plate all the way around, but you can see through the 6CB6A tubes. The characteristics of the 6CB6A and 6JK6 are actually similar, except the 6JK6 has about twice the plate resistance of the 6CB6A. This makes 6CB6As unusable for the only important 6JK6 application: A Marantz 10B tuner. 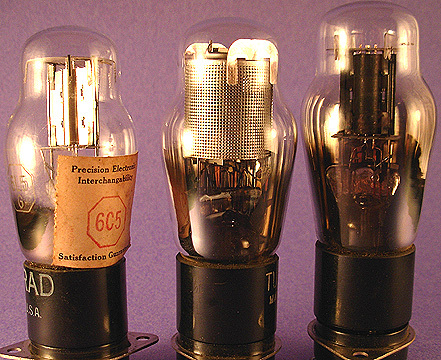 The two tubes at left are real RCA and Sylvania 6L6GC tubes. These are followed by National and Raytheon tubes falsely branded "made in England", and then by a tube correctly branded "made in Russia". Note the taller bulb of the Russian tube and the fact that the black base is slightly larger than the glass. I have also seen Russian 6L6GCs branded "W. Germany". The word "England" should be a red flag to a buyer. With the exception of Brimar, most British tube manufacturers labeled their tubes "Made in Great Britain". Compare these and the fake 7581A listed below. The picture at left shows a Russian 6L6GC rebranded as "7581A, W. Germany" by International Components Corporation to the left of a real General Electric 7581A. The second picture shows the same fake 7581A next to a correctly branded Russian 6L6GC. Note the taller bulb of the Russian tube and the fact that the black base is slightly larger than the glass. Also, as far as I know, all real 7581A tubes, no matter the brand, were made by General Electric. All should have the type number etched on the glass. The tube at left is a General Electric-made 5965 rebranded as "12AT7" by International Components Corporation. 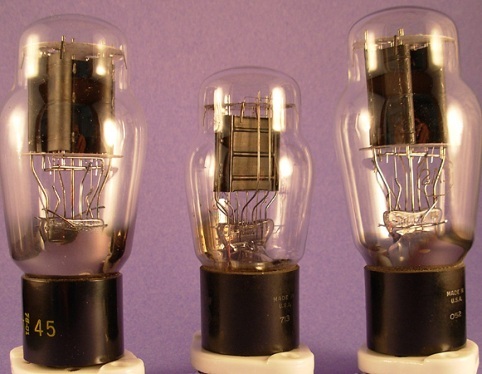 Compare it to a typical 12AT7 pictured in the center and a type 5965 tube at the right. The clincher is that the rebrander failed to remove the original tube type, and "5965" can be seen below the rebrand in the second picture. The 5965 is actually a computer-rated 12AV7. The 5965 has only 2/3 the gain of a 12AT7, and is not suitable for most applications calling for a 12AT7. Also see our listing of a fake 12AU7, where International Components Corporation rebranded the the same 5965 as a 12AU7. The two tubes at left are type 6414 tubes rebranded as "12AT7" by National. Compare them to a typical 12AT7 pictured to the right and a correctly branded 6414 at the far right. The 6414 is actually a computer-rated tube with only 60% of the gain of a 12AT7, and is not suitable for most applications calling for a 12AT7. These are two pictures of the same tubes. The tube at left is a 5965 rebranded as "12AU7" by International Components Corporation. The etched dot lot markings show it was made by General Electric. It is identical to the GE 5965 pictured next to it. 12AU7 tubes have several different plate configurations, but none are as large as these. It should be suspicious to the buyer that the type number as been removed from the rebranded tube. Some third party military and industrial suppliers like Sperry and Hewlett Packard sometimes removed the original type number to prevent their customers from going to the original supplier. In this case, the original type number was removed simply to fool a prospective buyer. The 5965 is actually a computer-rated 12AV7. The 5965 has twice the gain of a 12AU7, and is not suitable for most applications calling for a 12AU7. The tube at left is a type 1626 rebranded "12J5GT" by an unknown rebrander. The center tube is a real 12J5GT, while the tube at right is a correctly branded type 1626. The "GT" suffix would indicate a tubular T-9 bulb and an 8 pin octal base. The 1626 is not a good substitute for a 12J5GT. The most important difference is that the 1626 has a gain of 5 compared to a gain of 20 for the 12J5GT. This tube was rebranded by International Components Corp. Most older metal tubes have the type number stamped into the base like the "U.S.A." that shows up clearly in the picture above on the left. I became suspicious when I realized that the type number had been filed off or ground off these and the tubes were repainted. As it turns out, the stamping process leaves a mark on the inside of the metal skirt. I removed the base from one of these, and indeed "12SJ7" shows up clearly as shown in the second picture above. "12SJ7" was reversed on the inside of the skirt, so I reversed the image for easier reading. The 12SJ7 is a sharp cutoff pentode, while the 12SK7 is a remote cutoff pentode. The 12SJ7 and 12SK7 test similarly on a tube tester and will work for each other in many applications. However, if the brander was not afraid of saying this, why did they grind off the number on the tube? The answer is that most applications calling for a 12SK7 are optimized for a 12SK7. So, a 12SJ7 will give degraded performance. The tube at left, rebranded as United type "45", is actually a type 2A3. 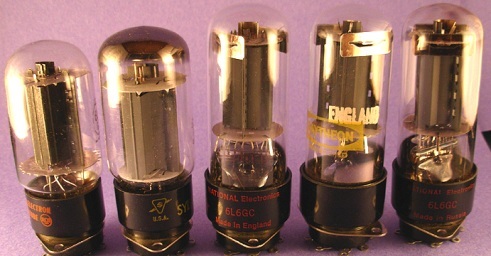 The tube at the center is a genuine type 45 and the tube at the right is a correctly marked 2A3. United was an old US maker of transmitting and industrial types. They NEVER made receiving tubes. Someone else owns the brand name and has used it to rebrand many types. The 2A3 is a poor sub for a type 45, chiefly because the filament of the 2A3 draws a full 1 amp more per tube. Since most radios and amplifiers use type 45 tubes in pairs or quartets, this would significantly tax the power transformer. The good news is that now 2A3 tubes are pretty valuable themselves, so the fake is not a total loss. The tube at left, branded "80" by Arcturus is really a 5W4G tube put on a 4 pin base. A correctly marked Arcturus 5W4G is shown at center with a real type 80 at the right for comparison. I had always thought that this was simply an odd-sized type 80, but a sharp-eyed fellow collector noticed a faint "5W4G" in an octagon on his example. I checked mine, and found the same thing. The 5W4G is not a good replacement for a type 80, since the 5W4G provides a maximum current of only 300mA versus 400mA for a type 80. This fake is scary, because a 6Y6GA tests "good" as a 8417 on most tube testers, including my Hickok 539C. The tube in the picture is not a 6AJ8/ECH81 made in Great Britain. It is really a 6JX8/ECH84 made in Spain. The tube tested bad as a 6AJ8, but I was perplexed, since it looked fine. Closer inspection revealed the type code (kd2) and factory/date code (S6D). "kd2" is the type code for ECH84, second version. For the factory and date code, "S6D", "S" is represents a Philips group factory in Barcelona, Spain, "6" is 1966 or 1976, and "D" is the month of April. A comparison picture is not given, since the ECH81 and ECH84 look identical. However, the pinouts of the two tubes are different, and the tubes are not substitutes. This was not a one-time mistake, since I was offered over 100 of these. The tube at left is clearly branded 6L5G, but has a paper tag labeling it as a 6C5. 6L5G tubes have a shiny nickel plate with no internal shielding. Most 6C5G tubes have a perforated or mesh shield as the center tube. To be fair, there is a rare form of the 6C5G made for Silvertone (pictured at right) that does not have the shield. The 6L5G is essentially a 150mA filament version of the 6C5G, which has a 300mA filament. However, the internal shield of the 6C5G makes the output capacitances much different. This tube was rebranded as United "6SQ7". United was an old US maker of transmitting and industrial types. They NEVER made receiving tubes. Someone else owns the brand name and has used it to rebrand many types. Most older metal tubes have the type number stamped into skirt, and this tube is no exception. however, one can see from the photo that "6SZ7" is stamped on this tube (I colored it in for visibility). The 6SZ7 is the 150mA filament version of the 6SQ7, which has a 300mA filament. So, the 6SZ7 will sub for a 6SQ7 in some cases. However, the vast majority of sets that use a 6SQ7 use it as part of a series string of tubes, and in this use, the 6SZ7 will not work. The tube at left is branded Lewis and Kaufman "6Y5GT". Lewis and Kaufman was an old US maker of transmitting and industrial types. They NEVER made receiving tubes. Someone else owns the brand name and has used it to rebrand many types. This is an odd case. The tube branded 6Y5GT has a shouldered bulb and a 5 pin base. The "GT" suffix would indicate a tubular T-9 bulb and an 8 pin octal base. Close examination under good light revealed that this was really a rebranded type 84 tube. The 6Y5 was originally introduced by Majestic, and it is a 6 pin, spray-shielded rectifier. An original Majestic 6Y5 as well as a slightly later Sylvania substitute are pictured at the center. The 6Y5 was also sold without the shield by other manufacturers. A correctly branded type 84 is at the right. Obviously, since it does not even have the same number of pins, the fake is not a usable sub. 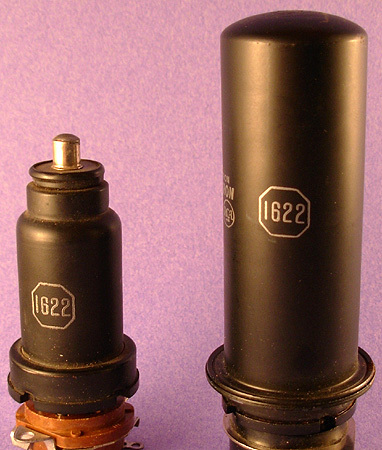 The tube at left is 1620 mis-numbered "1622". 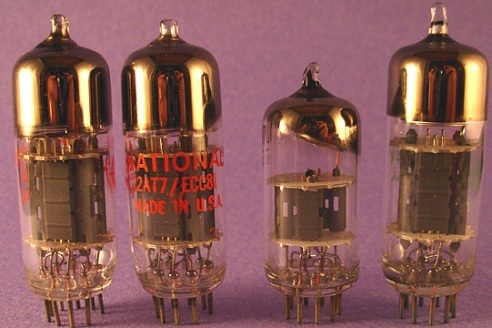 The 1620 is one of RCA's "1600 series" of of specially selected tubes, and this particular type is a 6J7 selected for low microphics. The tube at right is a "real" 1622. The 1622 is a 6L6 selected for low noise in theater sound systems. Most metal tubes have they type number stamped into the skirt. And, sure enough, the tube at left is stamped 6J7 and the one at right is stamped 6L6. The tube at left is 5693 mis-numbered "5963". 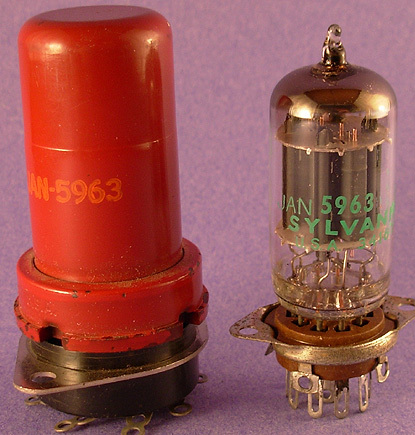 The 5693 is one of RCA's series of "special red" 10,000 hour tubes, and it is a premium replacement for the type 6SJ7. The glass tube at right is a "real" 5963. The 5963 is a 12AU7 developed for computer applications.